Last night I felt like getting some fresh air, so I decided to take a bike ride and explore the garbage in a place I’ve never really gone (to see garbage, at least). I went up north to Rosemont, where the pickup is in the morning to early afternoon. Because of this, some people leave their trash out before they go to bed, and there’s less of a “rush” for me to explore as much as possible before the truck comes and takes it all away. I found some pretty decent stuff. Check it out. 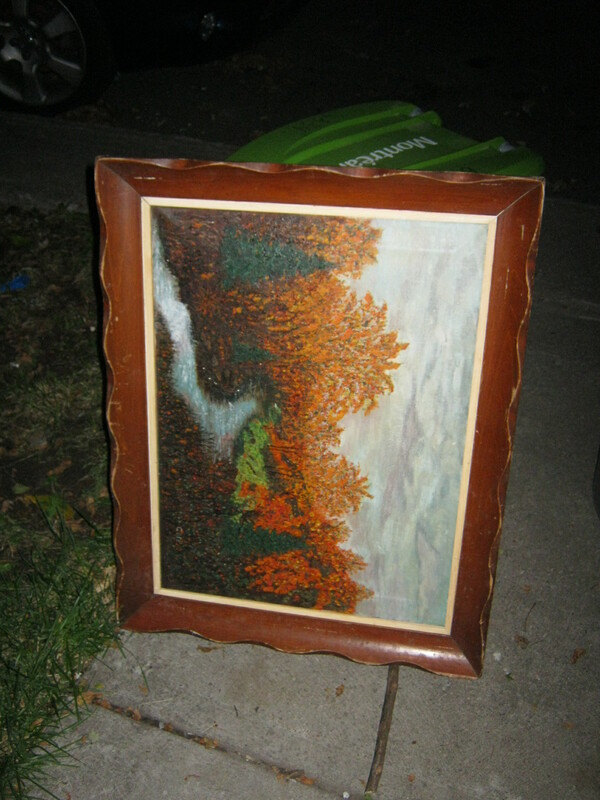 One of the first things I came across was this painting, marked “Côté,” just leaning up against a trash bin. I like it a lot. I took it home and it’s now on the wall in the living room. The back says it’s done by Gertrude Côté-Couture. 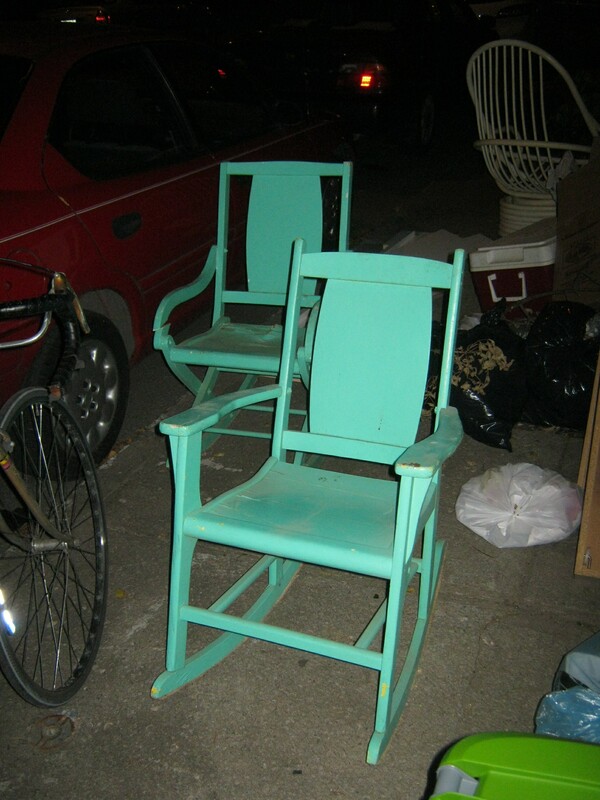 I found these rocking chairs. One was perfectly fine, and the other was slightly off but good for outdoors. Seemed wrong to waste them so I stashed them in an alley for someone else to find. 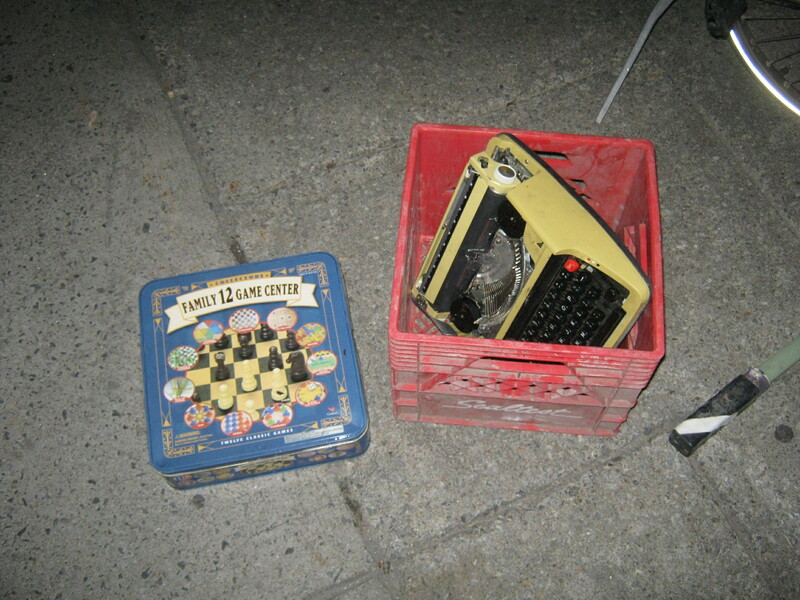 A good milk crate, board game set, and a decent looking typewriter. I left this on someone’s front step. They looked kind of hip, so maybe they made use of it. Worst comes to worst they have a minor moment of inconvenience! 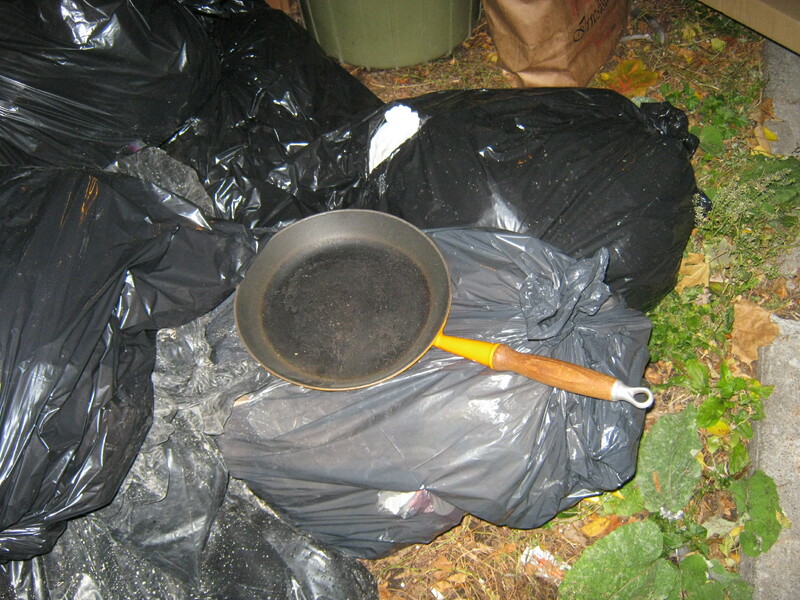 This frying pan was casually thrown on top of this pile of junk. It’s actually a pretty nice pan. It’s made by Le Creuset, a French cookware manufacturer that began business in 1925. 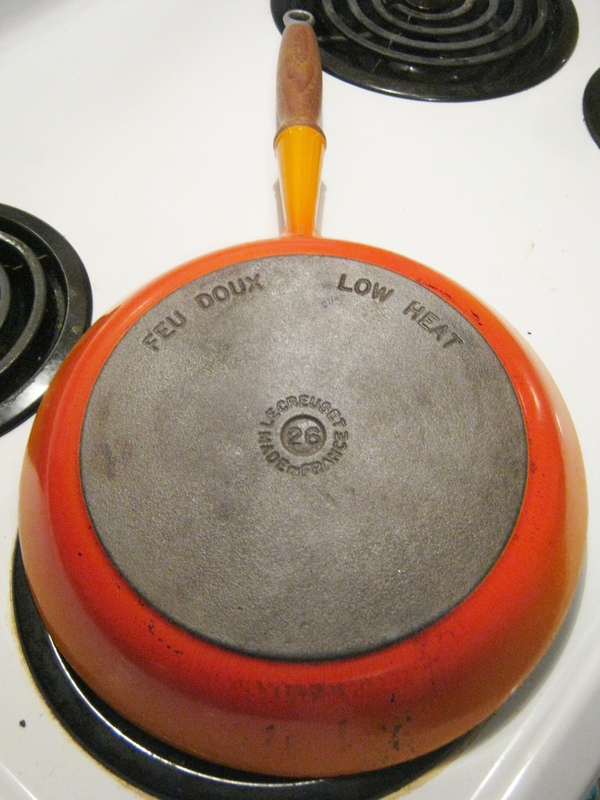 According to wiki, the rich “flame” color found on this pan is a signature of this company. 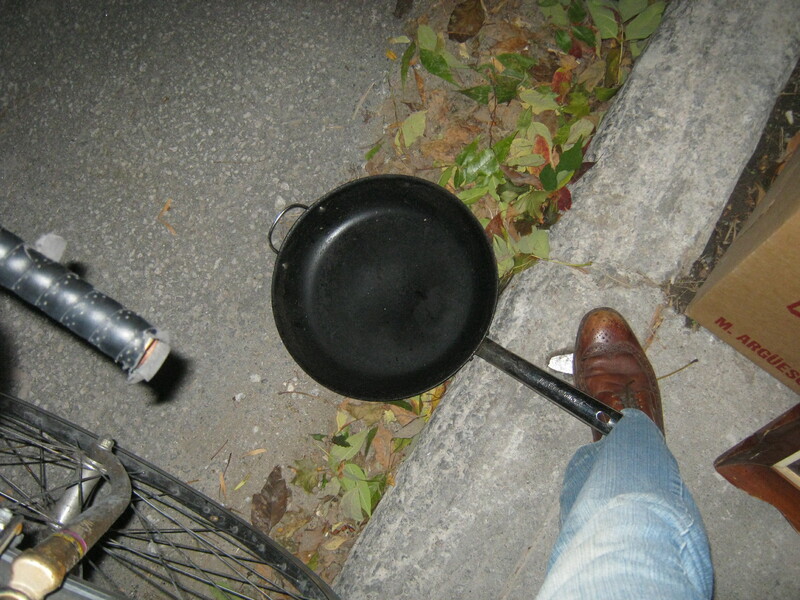 The same type of pan sold on Ebay for 15$, and another similar one sold for 70$, so there is a market for this apparently vintage pan, but I think I’ll use it myself. Cast iron never dies – it just needs some lovin’. This one needed a good scrub. I tried using a few different techniques, but in the end I found scraping it with a metal spatula and a spoon (for the rounder edges) worked best. Heating the pan seemed to make it easier. It took a while, maybe 30 minutes of actual effort, but it’s pretty smooth now. I just need to re-season it and it should be good to go. 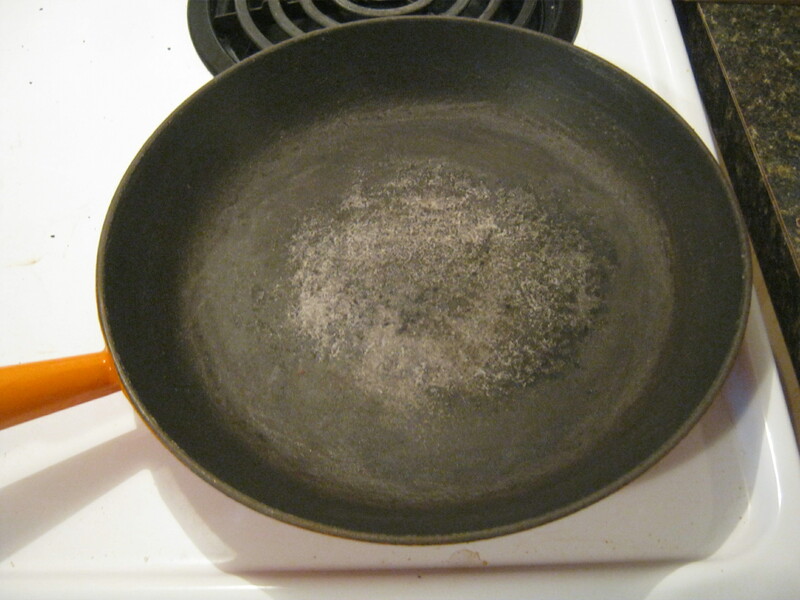 I found this frying pan too but it turned out to be a well used Teflon. I put it in the recycle. It’s hard to tell in the dark, although maybe I should have known by the weight. It was a good brand (Lagostina). Another typewriter! This one looked good but didn’t really have room I have way too many typewriters anyways. 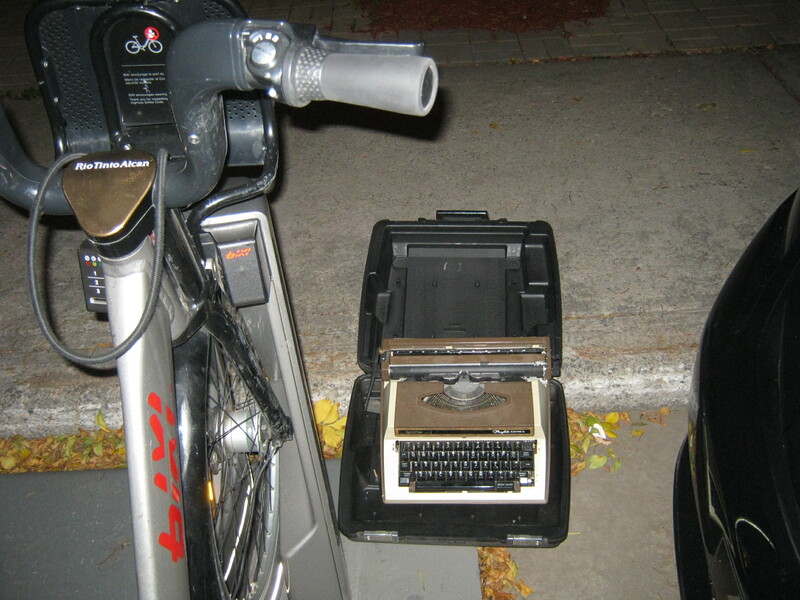 I left it by a bixi station – hopefully a hipster found it. And now for my last, heaviest, and favorite find of the find. 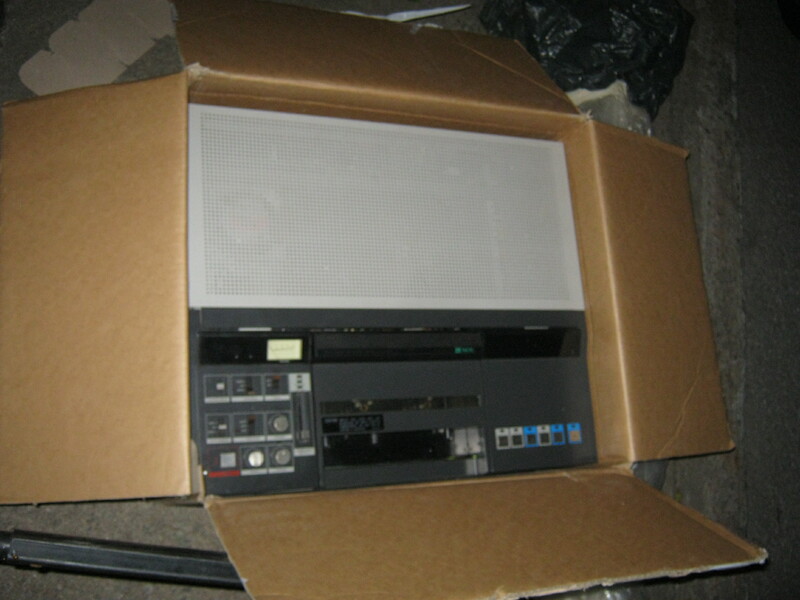 It’s a VCR, believe it or not, a JVC CP-5550U to be precise. It passed basic tested – the power and the lights turn on. 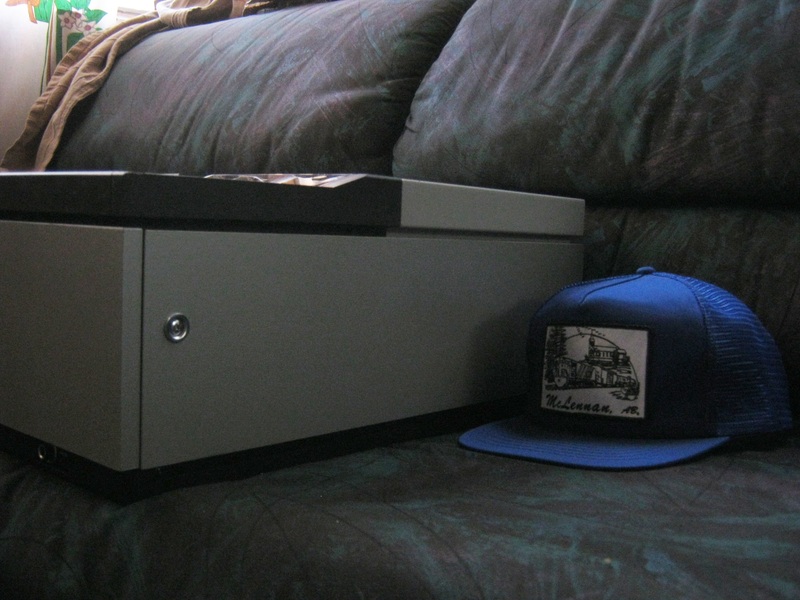 UPDATE (Jan 24, 2013): This turned out to be a U-Matic VTR. It’s frickin’ huge and super heavy. As you can see, it’s at least 3 hats wide, 2 hats long, and 1.5 hats tall. 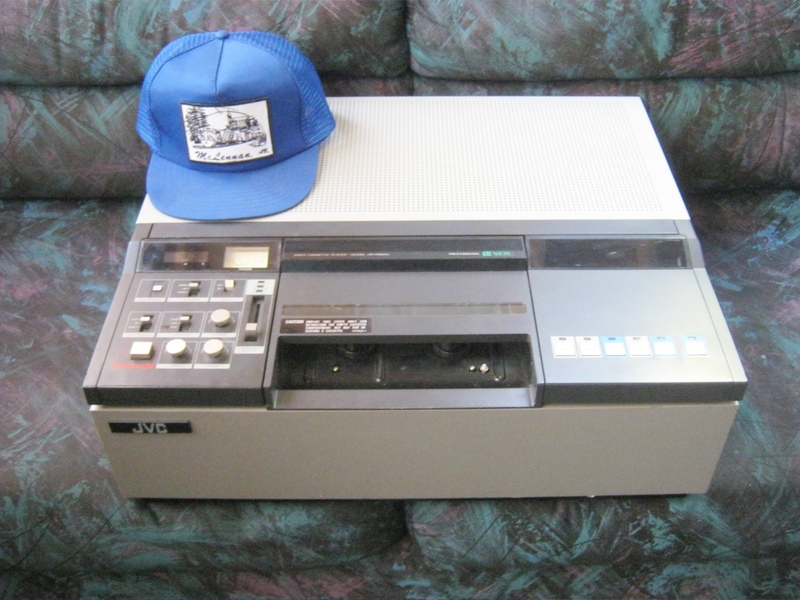 Using the hat metric, this VCR is probably at least 50% more hat in every direction as compared to a normal VCR. It also weighs at least 50 pounds (67.5 actually, just looked at the manual online), and I only got it back home (a good 5-7 minutes without carrying a 70 pound VCR) using sheer determination. I put it up on the handlebars of my bike (fortunately, it came in the box) and gingerly accelerated, trying to avoid any sudden movements. I’m happy I got it back, and glad it didn’t break my bike, but when I see something like this I just have to have it. It looks pretty cool on the inside. It’s actually quite clean, cosmetically and on the inside. 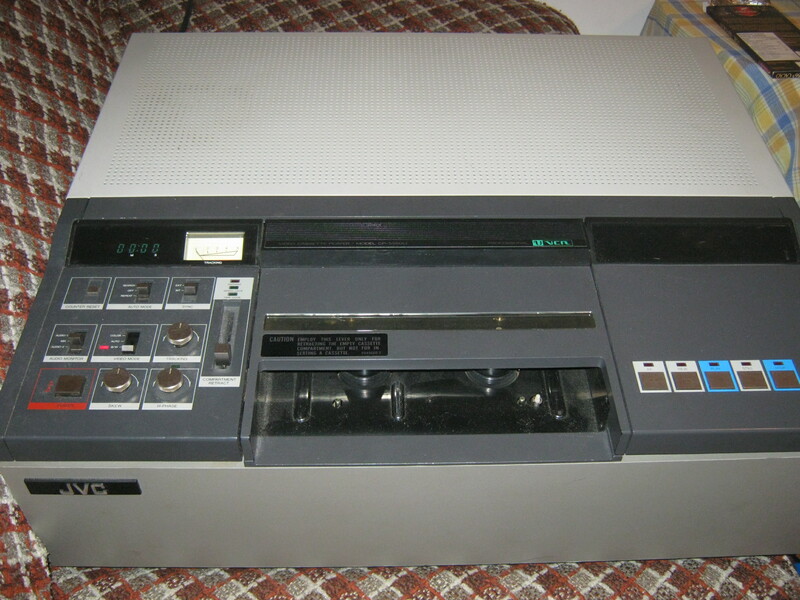 On the outside is written that this model is a “Professional” VCR and apparently this model was intended to be used for people looking to do film editing. (See the manual here). According to this website, this specific model’s original MSRP was 3360$, and I assume that was in 1980s money. Clearly it’s not worth that much now, but from what I see on the internet I could probably get around 100-200$ for it. Not bad. I do feel an irrational attachment to it, due to it’s ridiculous size and the journey it was to get it back home, but in the end if I can get money for it I won’t turn that down. I can’t say I ever heard of this artist and I couldn’t find anything via Google on her. Nevertheless, it is a relaxing image for a wall. Is the sky mottled, or is that the canvas buckling? I just ran across this (http://greatist.com/health/bread-hacks/) which you may find useful for the artworks you find. Those are nice rockers. I’ve seen the rear one before (a gift in the 1950s to my great aunt; hers was painted flamingo pink). What’s the fascination with typewriters? You’re certainly getting your kitchen fitted up nicely with all the excellent pots and pans you’ve been finding. That VCR looks like one J.S. had back in the mid-1990s. 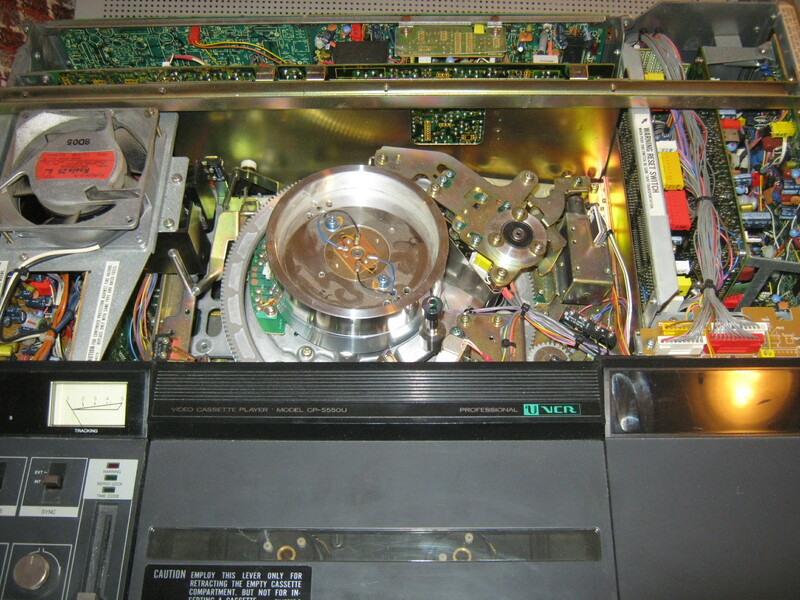 Those big heavy VCRs were good machines; the newer lightweight/plastic-parts ones are mostly just rip-off pieces of s*it (pardon my French). I’m looking forward to clapping eyes on your Etsy store once you get it up. Oh my God the rocking chairs!!! I would have totally taken them. And the typewriter. And the pots. 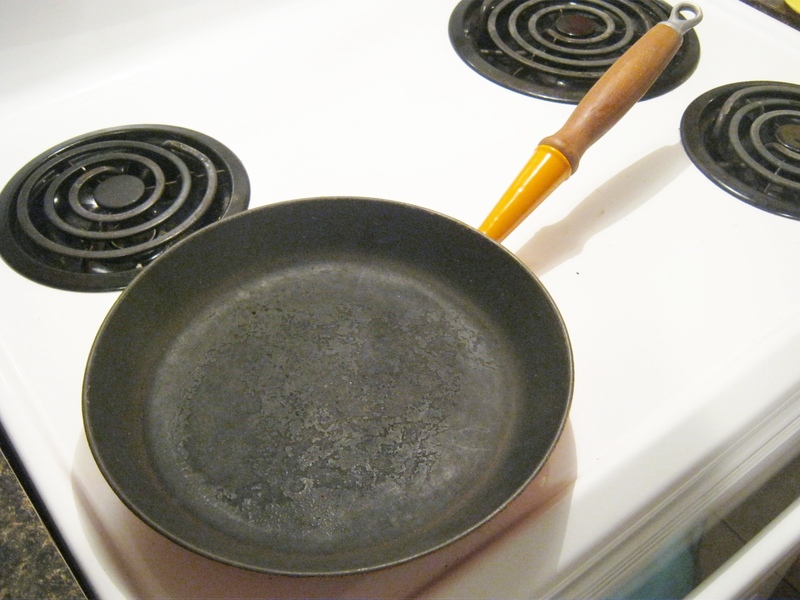 In the future, for any cast iron grime- salt and oil work WONDERS, especially for rust. Just put some salt and equal parts oil, rub it around with a towel, focusing on the thick grimey parts. Rusty cast iron can look gross but that salt/oil thing is marvelous.